Dr Lynsey Mahmood talks about her mindfulness research on the Greater Good Science Center Podcast. The Greater Good Science Center, University of California, Berkeley, is an interdisciplinary research centre devoted to the scientific understanding of individual happiness, compassion, strong social bonding, and altruistic behaviour. It also shares a weekly podcast on its website about the science of happiness. 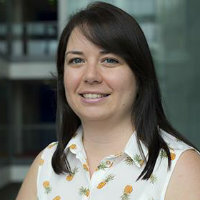 Dr Lynsey Mahmood, is Lecturer in Organisational Psychology at City, University of London. In a recent podcast for the centre, she spoke with presenter Dacher Keltner about findings from mindfulness research she co-authored. The study involved a well-known meditation exercise, in which a person mindfully eats a raisin, paying attention to its appearance, texture in the mouth, taste. It investigated whether this mindful practice biased participants' interpretations of whether the personal views of the writer of an article for (or against) the use of nuclear power matched the written argument they had made.